Easter Bow with Easter eggs will be a great treat for her Easter basket. 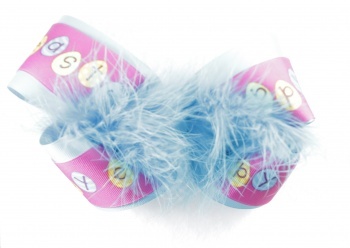 This is a turquoise feather boa that lines the middle of this double lined bow. The bottom layer is a 2.25" turquoise grosgrain ribbon with a 1.5" purple grosgrain ribbon on top. This purple ribbon has the words Happy Easter written in the eggs. The eggs run a color pattern of yellow, turquoise and lime green. Then a yellow chick a dee tweets away as it sits on a lime green scroll that has flower petals. The center is wrapped with a turquoise ribbon into a French knot.